I know this record may not be particularly politically correct but so what…its a free country. Oh no, I forgot. It isn’t any more. We only pay lip service to the idea of democracy these days. It almost makes you long for the early 1970s when nonsense like this was made. Of course she’s referring to her cat !! Play this record whilst wearing flared trousers and watching an episode of “Life on Mars”…. I can’t even find a picture of Katina. There would probably have been a picture, or an advert or a review of the single at the time in the pop papers like “Record Mirror” and “Disc and Music Echo” but where do you put your hand on copies of those now ?? Those are the sort of things that ought to be archived on the Internet !! 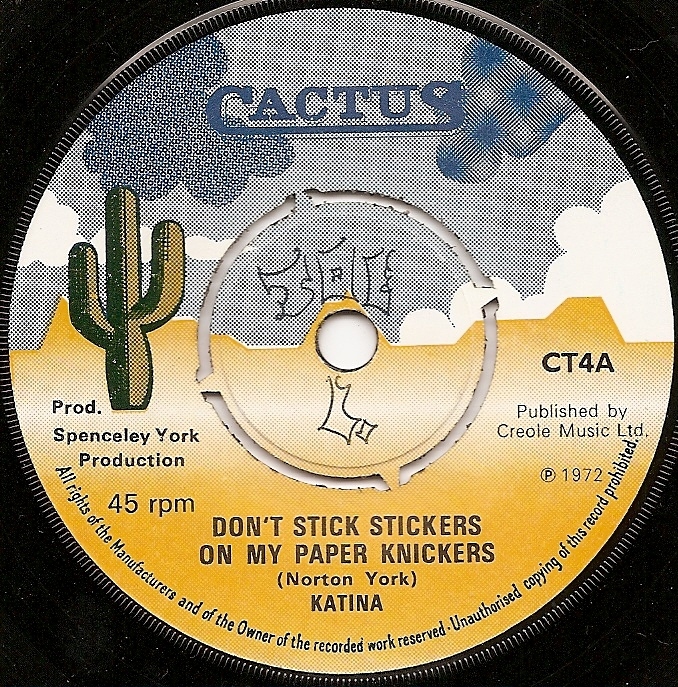 The follow up single by Katina went by the snappy title of “Don’t stick stickers on my paper knickers”. It was also released on the Cactus label (CT4) in 1972. Cactus was home to some great “english” reggae from the likes of Judge Dread and Rupie Edwards. I actually marched into my local record shop in 1972 and asked for this record by name. Surprisingly they had a copy. 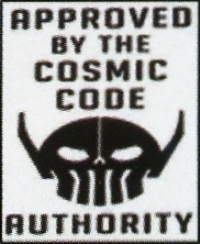 Alas despite searching my shelves and boxes I can’t find it anywhere now. Not even out there on the Internet. All I’ve been able to find is a poor quality recording made from the radio (RNI) at the time of its release that isn’t of a good enough quality to share. I can decypher the lyrics though……. I went out with a boy who put stickers all over his car. “Disc Brakes”, “Put a Tiger in my Tank”, and “Ma, Don’t burn your Bra”. “Clunk Click every Trip”, “Make Love not War”. Drop dead ! Don’t stick stickers on my paper knickers. That’s one thing that I don’t allow. I may have liked it once, but I don’t allow it now. Standing on a platform waiting to catch a train. I found I couldn’t move and how can I explain? I heard the rattle of a pail as the man walked away. I looked down and right across me read “Grand Opening, Everyone Welcome, Come Today!!”. All the words in the world won’t change my mind. There’s a way to get me going and it’s not too hard to find. The rules of the game are really rather nice. I’ll try anything once, and the nice things twice ! I got the sack the other day. I really don’t know why. I was dressing this window model and I looked up to the sky. I was “In the Sale”, “Reduced by Half” and “Bargain of the Week” !! “Don’t stick stickers” also appeared on a compilation LP entitled “Just Reggae” on the Polydor label in 1975. This LP seems to be as rare as Katina’s single. I did see a copy for sale on eBay in France for 28 euros. I was tempted for about 10 seconds but it seemed rather expensive just to hear the one track I wanted. PS: So If there is anyone out there with a “clean” mp3 copy of “Don’t Stick” (and its “b” side “version” !!!) by Katina to share with me I’d love to hear from you.